Benjamin Jacob Grimm was born in New York’s Lower East Side, a rough and tumble neighborhood where disputes were settled with fists. It’s no wonder he grew up to become the Fantastic Four’s musclebound brawler: “The Thing” a behemoth with a rocklike hide he developed after a heavy dose of cosmic radiation received during a mission in space. These days, Ben still settles disputes with his fists... and manhole covers... and two-ton metal girders. First appearing in Marvel Comics’ “Fantastic Four” #1 in 1961 by Stan Lee and Jack Kirby, it has often been acknowledged that “The Thing” is Jack Kirby’s alter ego. Like the fictitious Ben Grimm, Jack Kirby was a young street fighter from the Lower East Side, and both have a penchant for smoking cigars and cracking the occasional bristly remark. Beyond that, it’s also easy to see the physical similarities. Ben has Jack’s square jaw, and the exaggerated brow lends similarity to Kirby’s thick eyebrows. This sturdy 1:1 scale bust from Sideshow Collectibles is sculpted by Spectral Motion’s Chet Zar. Spectral designed the “Thing” costume for the blockbuster “Fantastic Four” movie. 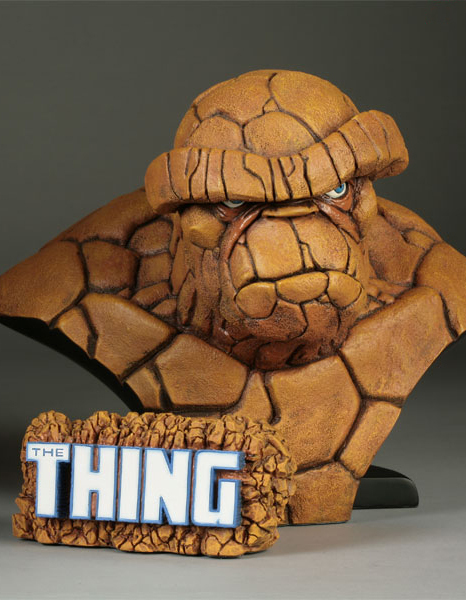 Chet and Spectral Motion were overjoyed at the chance to do a take on the iconic comic book version of the ever lovin’ blue-eyed Thing for the Sideshow collection. If the movie version of the character is meant to have Michael Chiklis beneath the rocky skin, then at the core of this version lies the heart and soul of Ben Grimm’s true alter ego, the undisputed king of comics, Jack Kirby. With his trademark sneer, sideways glance and a brow ridge you could land a pasenger plane on, this dynamic life sized bust seems to have burst right out of the pages of the classic Marvel comic book and brings Aunt Petunia’s favorite nephew to astonishingly lifelike reality.